…[F]ive hundred years ago (as of 2017), a humble Augustinian monk challenged the whole Western world through the deceptively simple act of posting a list of objections to the corruptions of the medieval church on the doors of the cathedral in Wittenberg, Germany. 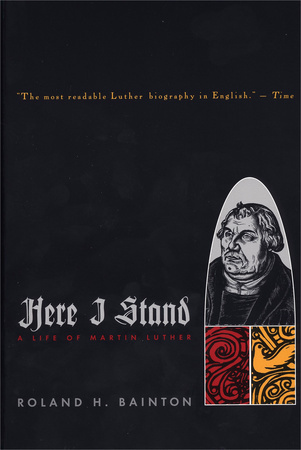 Though accused of heresy, subjected to trial and censorship, and threatened with excommunication and death, Luther stood firm. This classic offers a compelling portrait of the Reformer who dared to follow God against powerful opposition. Bainton’s words are punctuated by more than one hundred Renaissance drawings, woodcuts, and engravings from Luther’s own era, all from Bainton’s personal collection.